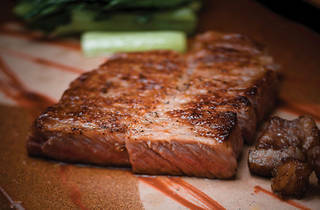 The melt-in-your-mouth beefy goodness of Kobe beef is unrivalled. The tender, rich feel, sweet meaty fragrances and evenly spread layers of delicate fat makes a cut from that rare Tajima cow superior to other land faring meats. But how does one cook this most revered culinary ingredient? 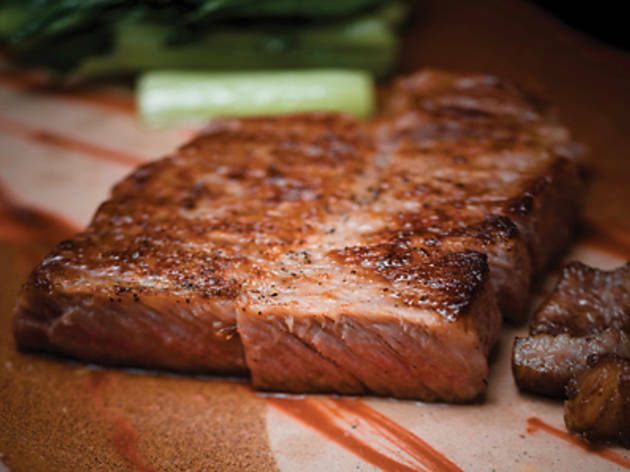 Pan-frying it over an iron griddle teppanyaki-style is how newly opened restaurant, Teppanyaki Ginza Sumikawa does it – and the result is a juicy, delicious piece of steak that’ll have you cherishing each bite. Sumikawa is a top-of-the-line teppanyaki restaurant; everything from the tableware and furniture, to the produce and mostly importantly, the beef, are all flown in from Japan. The aim here is to bring customers an authentic Japanese dining experience, where the attention to detail, meticulous care and preparation of the food is reflected in the flavour. Be prepared for some generous spending though. The minimum for two people will set you back at least $3,000. As we enter the restaurant we notice the variegated, earthy Japanese Cyprus panelling on the walls and the stone floor walkway, which gives the space a calming zen feel. The decorations are minimal and there is no open dining area, which works in Sumikawa’s favour. The restaurant is structured into four private, minimalistic-styled rooms, so diners can have an intimate experience while they socialise, with the expert chef cooking the food in front of them. The main focus here is the food after all, and the restaurant takes great care in getting rid of frivolous distractions. The menu has both an à la carte and a dinner set option which starts at $1,280 and gets more expensive depending on how you customise your set. Strategically, if you want to get your belly full and your money’s worth, your best bet is to go for the dinner set. We opt for the set and begin our meal with a light sashimi trio of red snapper, mackerel and squid ($280 à la carte). The fish are treated with a light drizzle of oil, seasoned with a bit of salt and pepper, and topped with slivers of Japanese leeks and chives. This is a refreshing start. The fresh sweetness of the fish combined with its delicate texture open up the palate. Next is the French foie gras and daikon radish in truffle sauce ($380 à la carte). It’s surprisingly light with the daikon cutting through the fatty components of the foie gras while soaking up all the juices. The contrast of textures gives the dish a delectable bite. To wash it all down, we take a sip of the Japanese Kuroge Wagyu soup ($200 à la carte). The clear broth is basically a beef consommé with a clean, comforting and savoury flavour. It’s a delightful palate cleanser in preparation for the super fresh giant Japanese tiger prawn ($300 à la carte) and dancing grilled lobster ($980 à la carte). Both are cooked to succulent perfection with each tantalising bite giving off a delightful briny flavour. The essence of teppanyaki stays true to the quality and natural flavours of ingredients, so little is done with seasoning besides salt and pepper. Finally, we reach the main event of the evening – an A4 Kuroge Wagyu Fillet (à la carte, $1,150) and the top of the line A5 Supreme Kobe beef sirloin (à la carte, $1,420). After you take a piece of that medium-rare goodness into your mouth and let the fine fat marbling melt on your tongue, you’ll get so lost, you might be inclined to give off a ‘moo’ of excitement. The beef is fragrant, full of natural rich flavour and feels oh so smooth and luxurious. If that doesn’t get you full, the aromatic fried garlic rice ($80 à la carte) with fatty beef bits will – and it’s also excellent. The rice is perfectly cooked and soaks up all the delicious beef fat for a decadent take on a staple dish. To end the night we choose a simple and refreshingly tart Yuzu sherbet to cut through the fat for a pleasant end to a satisfying and comprehensive meal. Teppanyaki Ginza Sumikawa 1/F Hollywood Centre, 77-91 Queen’s Rd W, Sheung Wan; 3568 7788.